I like beige but a lot of people don’t. I have heard it used to describe blandness, the colour equivalent of the word “nice”. Unimaginative. Boring. People tried to make it more exciting by calling it taupe but ultimately it is still beige. Many moons ago we knew a guy called Hugh. He was a decent chap, quiet elderly. Reserved, dependable, subtle and unspectacular. You could easily describe him as a “nice” guy. Wore a lot of beige. True, Hugh wasn’t outlandish or leading a jet-set lifestyle and always appeared in smart beige trousers and a camel coloured cashmere jersey, but boring seemed a bit harsh. I liked Hugh. A good number of years later I find myself languishing in student digs on the campus of a university just outside Christchurch, New Zealand. I should be out collecting data on female limited sexual polymorphism in coenagrionid damselflies but it is raining so instead I am watching some limited overs cricket with housemates Scott and Blair. The weather in Perth is much nicer and people are slathered in sun block and knocking back cold beers. The camera zooms in on one group of supporters who are rather raucous. Sunstroked or inebriated it is hard to tell which, probably both. They are all, every single one of them, dressed in beige. This begs the question: who exactly are the Beige Brigade? Scott explains that back in 1980’s the New Zealand cricket team were sent out to do battle in various limited over cricket competitions wearing… beige. This kit became a bit of a joke, much maligned and regarded as a little embarrassing. 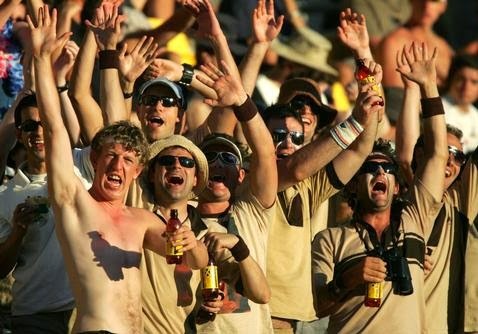 In 1999 a group of Kiwi supporters decided to take back beige and make it cool again. They made their own beige cricket kits and wore them to matches – thus the Beige Brigade was born. 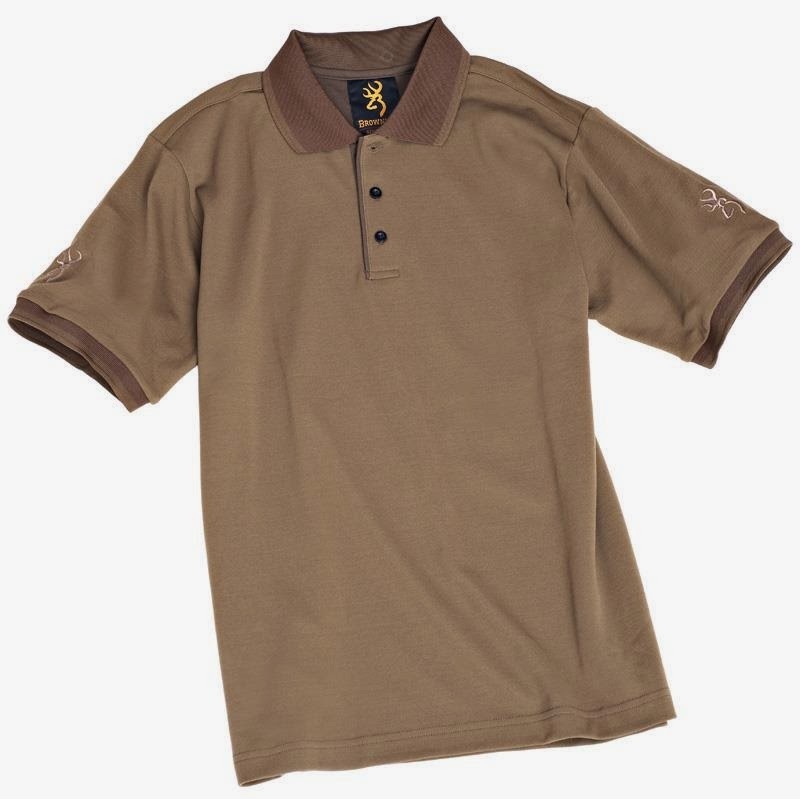 So beige is often seen as boring, a fashion faux pas or something to be laughed at. Not so, in my humble opinion. I like beige. There is a lot of beige on the Patch, especially at this time of year. We just entering the first green flushes of spring but most things about the Patch are still lovely and brown. I am down on the marshes surrounded by beige. Hedgerows are bare of leaves and stripped of berries, the grasses in the meadows and on the marsh have been desiccated by wind, salt and frost. The remaining straw is, well, straw coloured. Beige. The morning sun is just starting to have some genuine warmth to it and today it is bright and constant due to the cloudless sky, the first such sky in a while. It is now, in this most welcome sunshine, that the beige flares into life. 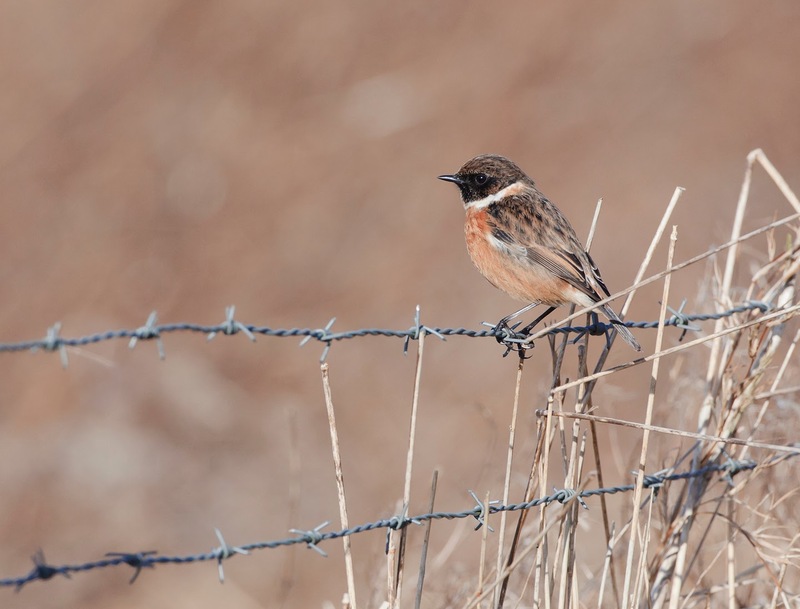 It becomes golden, terracotta and all colours in between – and it makes a great background to photograph Stonechats too. 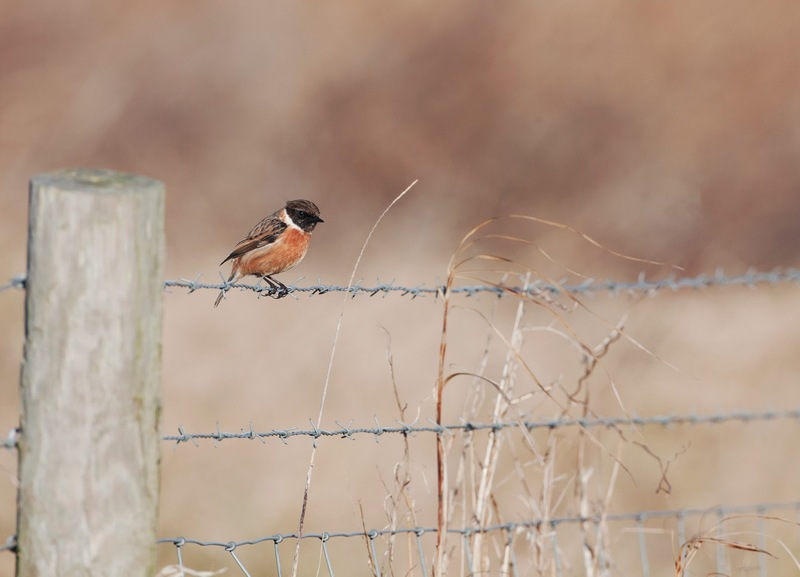 On a recent trip to the Outer Rim I noticed these Stonechats and resolved to return with the camera when work and weather allowed. Fortunately I didn’t have to wait long for an opportunity. 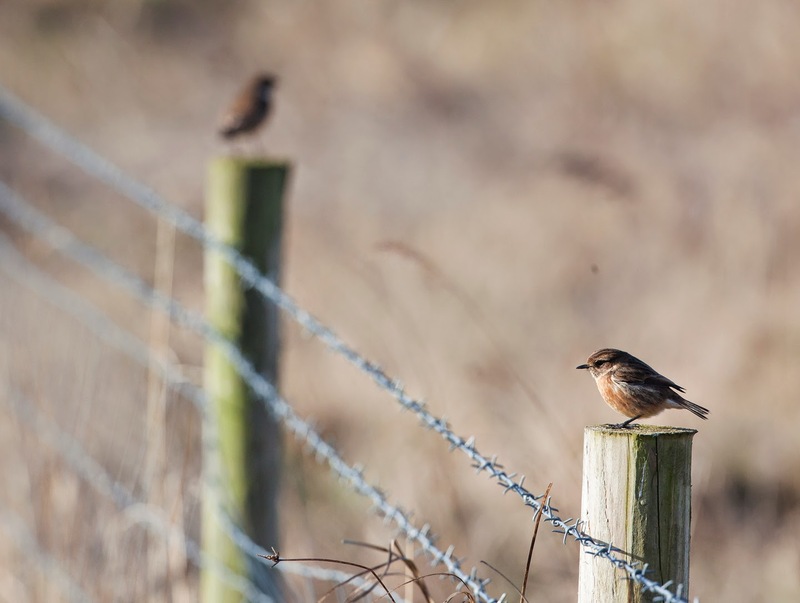 These birds are feeding on the marsh close to the footpath from Neston to Burton. 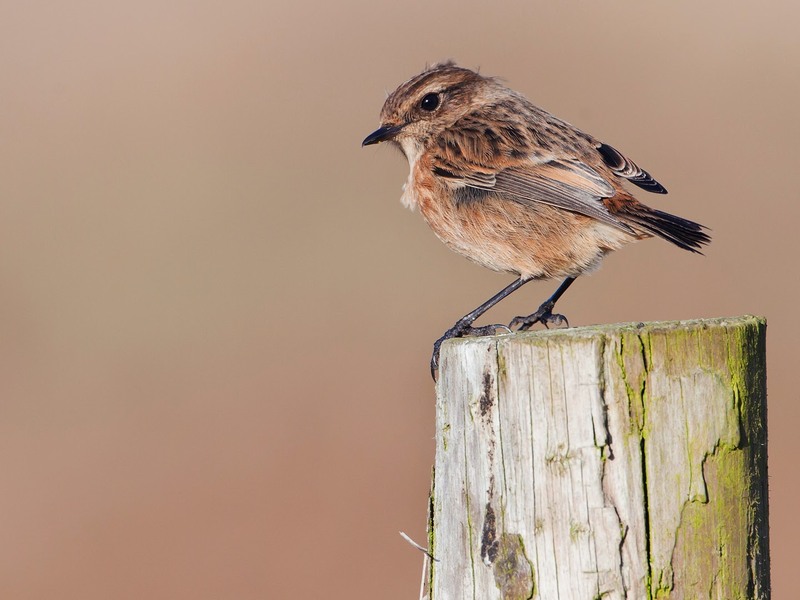 They regularly use the fence posts and the barbed wire they hold up to watch for prey. Being on the foot path the birds have become used to people and all the stuff that they bring. Dogs, bikes fluorescent jogging tops to name a few. As a result they are quite tame and don’t mind a guy dressed in drab brown and beige colours hanging around taking their picture. 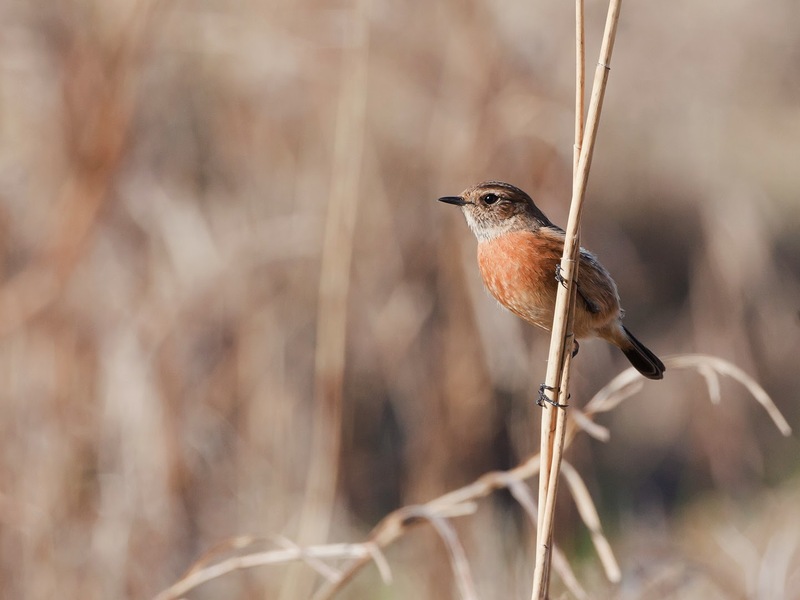 I like Stonechats so I take a lot of pictures and the beige of the marshes grasses compliments their subtle but rich colours perfectly. The delicate changes in tone and shade in this sumptuous light makes the background of the pictures look velvety smooth. 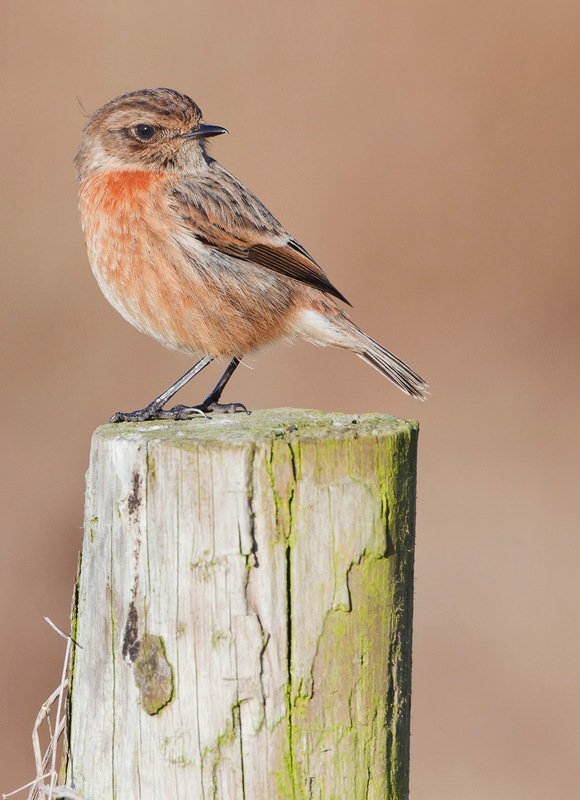 Pretty soon the blank memory cards I brought with me are filling up with regulation pictures of Stonechats in good light. They are nothing out of the ordinary, just portraits really, but it is just great to be out getting pictures on a sunny and still day after so many trips our spoiled by wind and rain. 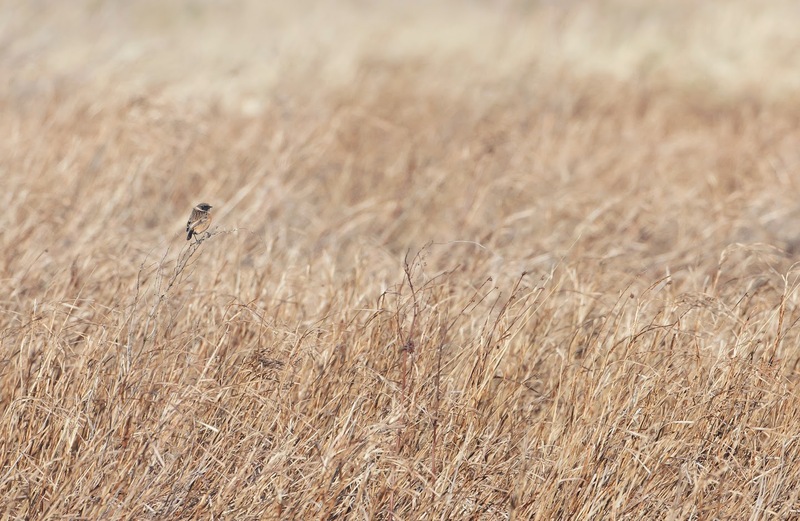 Its also rewarding to spend a good deal of time with these birds. Getting good close views I can appreciate their colours, calls and behaviour. Over a few visits I learn their routine, become able to anticipate their next moves, learn what their favourite food is - hairy caterpillars. I start to refer to them as my Beige Brigade. The plumage is wonderful too. Shades of beige smoulder to burnt orange with speckles and patterns on their backs. Subtle not spectacular. Pure, brilliant beige indeed! Beautiful little birds against the soft beige background... perfect! I think I need to grab my long lens and get out and shoot before the green takes over! I have Created new blog for your entertainment. Post your comment whether you are enjoyed or not .